Penetration testers, rejoice! While conducting application penetration tests it’s sometimes necessary to request specific information from the application owner or client. As a pen tester it can be extremely beneficial to perform a test with a full directory and file listing of the application, which sometimes can be difficult to acquire. So let’s assume all clients are perfect and provide a full directory and file listing of their application (funny, I know) but what do we do with it? My process usually involves manually looking over everything trying to find keywords which jump out… I just might want to take a look at adminpassword.txt. Depending on the size of the application I may attempt to reach every file but usually this is not an efficient use of time. 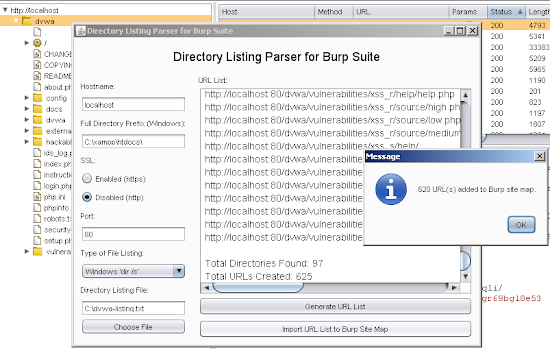 I wanted to create a quick and easy process for dealing with directory and file listings so I created a Burp Suite extension which will do a lot of the work for me. A GUI will appear for the extension. Fields such as hostname, SSL, and port will automatically populate depending on the request or response the menu option was originally invoked from. Cookies will also be displayed and used in any requests the extension makes. This feature makes it easy to compare site maps of two application user roles (based on varying session information such as cookies) to determine if each role has the correct access. In this example I have selected the “Import Directory Listing” menu option on the DVWA web application which is running on my local machine. Now we must fill out all options on the left side of the GUI including hostname, full directory path (windows only, but CAN be used to modify URLs from a linux listing type) which specifies where the root of the web application sits, SSL, port, file listing type, and path to listing file. 09/08/2010  09:50 PM    <DIR>          . 09/08/2010  09:50 PM    <DIR>          ..
A text area is populated with the URLs and the total count of directories and files processed. At this point we have a few options. We can take our list of URLs and use them in Burp’s Intruder. To do this it would be very easy, all that needs to be done is remove the protocol, hostname, and port from each URL within a text editor. From there we take the path of each resource as a payload in a GET request in Intruder. We could then look to see which resources we are able to reach by analyzing status codes and content length. 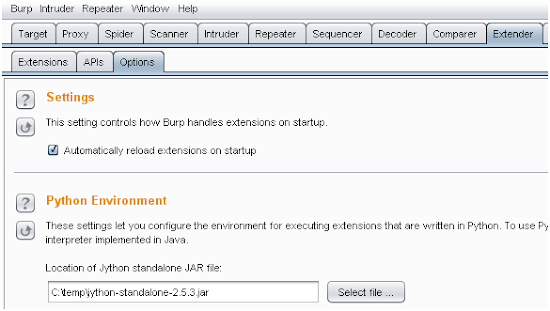 A second option is built into the extension via the “Import URL List to Burp Site Map” button. This button makes a request to each URL in the list (with cookie information, if it was found) and if a valid response is returned, will add the request and response to Burp’s Site Map. Requests with keywords such as logout, logoff, etc. are skipped to avoid ending sessions. The import to site map functionality was one of the main features I wanted to implement. Warning: Actual requests are being made. Remove any resources you don't want being made, such as delete_database.php!! Regex to remove resources will be added in updates. Done! A message dialog tells the user how many URLs were valid and imported into the site map. 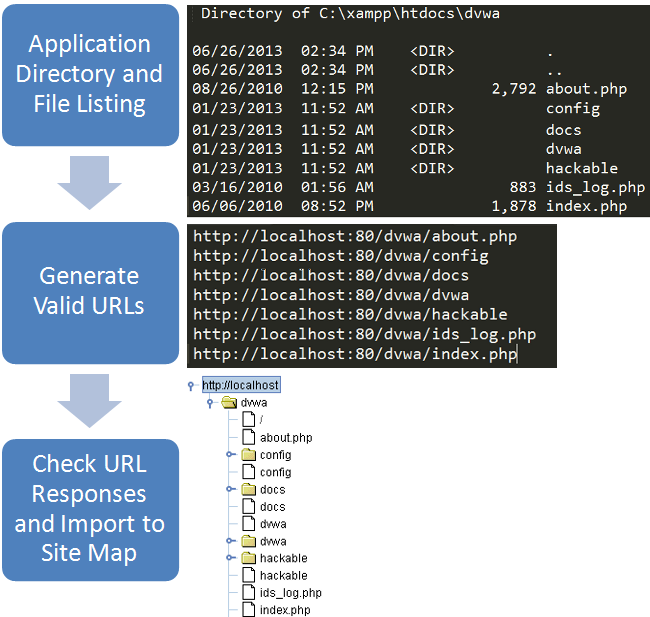 In the above image you can see a full site map and proxy history which was not found by spidering or brute forcing directories/files, but rather a simple directory and file listing of the application. With a full site map we are now ahead of the game. If you have multiple testers testing an application you can save the state in Burp and distribute it to save time, almost completely bypassing the discovery phase. 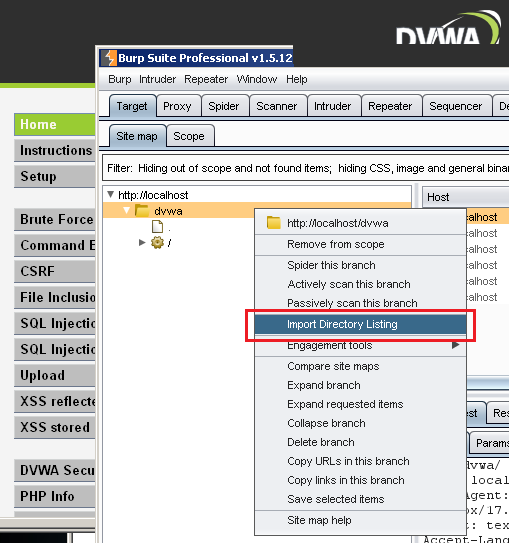 Note: So far the parsing does not consider virtual directories or different URL mappings from different web frameworks. Future updates may include parsing of mapping files such as ASP.NET’s web.config and Java’s web.xml. Also, please provide feedback if you use this extension. With many different output formats for directory and file listings it can be difficult to write a dynamic parser which works for every format. If you have a listing file which is not being properly parsed please contact me so I can include it in an update. Thanks! Nice work! I'm anxious to try this out. I wanted to accept multiple directory listing types because web apps sit on all sorts of different machines and a listing from Jython is not always the easiest to get from a customer when pen testing their application. Sometimes it's just easier for them to open up cmd.exe and run a 'dir /s' command or something similar on their respective OS. The python script dont work. Hey Victor, how are you loading the extension? The import error seems like it would come from not running the extension properly. 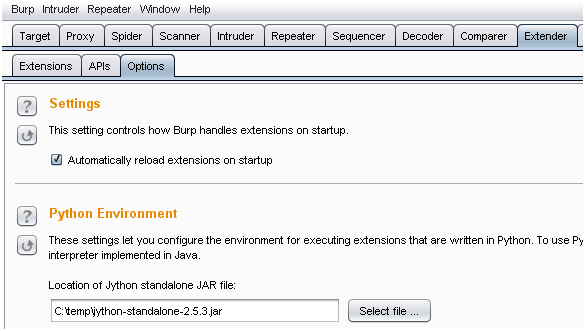 It should only be used through Burp's extension tab (Burp Suite Professional) with a standalone Jython jar loaded in the Extender>Options tab (this is the one I used: http://search.maven.org/remotecontent?filepath=org/python/jython-standalone/2.5.3/jython-standalone-2.5.3.jar). Let me know if you have any further issues. Thanks a lot for the feedback, I'll be looking into this and try to get it working with all jython versions. Hey thanks for your input, the inspath tool looks interesting. When I have time I would definitely like to add more parsing support. Care to elaborate on importing urls from google? Sounds like it could almost warrant its own extension. Thanks a lot for such a great piece of code! I really like it! This addon is really really cool!